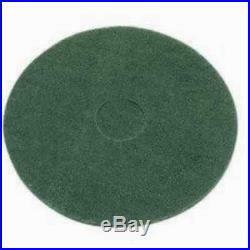 15 Inch Diameter Green Floor Pads – Used for Floor Scrubbing and Cleaning. Floor Polisher / Floor Maintainer / Floor Buffer. Box of 5 Thick Pads. Premium Green Scrubbing and Cleaning Pads – 15 packed in a box of 5…. 16 Inch Diameter Green Floor Pads – Used for Floor Scrubbing and Cleaning. Floor Polisher / Floor Maintainer / Floor Buffer. Box of 5 Thick Pads. Premium Green Scrubbing and Cleaning Pads – 16 packed in a box of 5….